P & O Ferries withdrew from the Portsmouth - Bilbao route at the end of September 2010. Brittany Ferries now operate 2 sailings weekly. Although I have never been a particularly good sailor, the promotional literature suggests "The Pride of Bilbao" is a smooth, fully stabilised vessel and one of the most luxurious ships in the P&O Ferries fleet and with this in mind Amanda and I (along with her sister Susan, who has no interest in birds whatsoever, but did take the photos) decided to arrange a “minicruise” to, hopefully, see some lifers for me, some whales for Amanda and a bit of culture for all three of us. 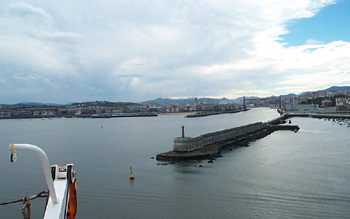 The Company of Whales offer Whale and Dolphin watching holidays using the Portsmouth to Bilbao ferry, complete with wildlife guides, but with a saving of over £100 each we decided to go it alone. At this time of the year the average time available for sea watching, if you are really addicted, is a little over 30 hours over three days. There is also approx 4 hours birding time available on the hills behind Bilbao. With The Company of Wales having sole access to the viewing platform directly above the bridge, watching points are from the side only but these are sheltered by the bridge. 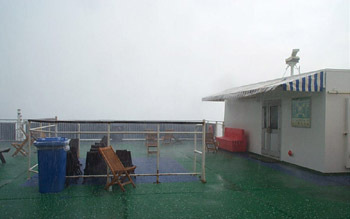 Deck 11 allows a view of approximately 140 degrees on both sides from 135 feet above sea level. Dependant on both wind and sun, one side may be more comfortable than the other, but the deck is open and you can move freely from side to side. A telescope is a distinct advantage, especially with a Velcro strap to affix your tripod to the rails. Engine vibrations are minimal. However if wind speeds exceed 20mph getting a good steady image can be a problem. A four-storey car park at Portsmouth Continental Ferry Port provides 516 passenger parking spaces just 250 metres from the main ferry terminal. Open 24 hours a day, the car park is well lit and incorporates the latest automated car parking technology and security. Parking is £21 for the 72 hour return. As you approach the P&O dock it is clearly signposted. Sailings are twice weekly. Departure is 20.45 hrs and you have to be at the terminal one hour beforehand. 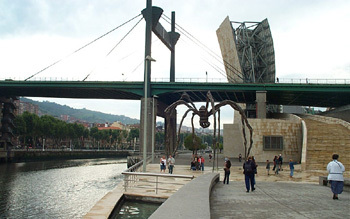 You arrive in Bilbao early in the morning two days later and leave around noon the same day. You arrive back at Portsmouth at 17.15 hrs the following day. You will need a full 10 year passport at the Spanish end. En-suite accommodation is adequate but cramped. The Company of Whales brochure suggest paying £40 extra for a more spacious outside window cabin. Whilst not measuring the dimensions of our window cabin, it looked exactly the same as the internal cabin Susan occupied. Linen is changed on the return leg. On board there are cinemas, a lower deck swimming pool and play area for small children, bars and restaurants. A cabaret is also provided free. The quality of the food is adequate with several outlets catering for all tastes and pockets. Early morning watching can be cold and a selection of body warmers, waterproofs and gloves can be handy. Later, if the sun comes out, clothes are shed and then replaced in the evening. UV light penetrates through light cloud and sun burn can therefore be a problem during long periods on deck, even when the sun is not out. Whales, Dolphins, and Porpoises (DK Handbooks) by Mark Carwardine (currently out of print). Mark Carwardine's Guide to Whale Watching - Britain & Europe - Where to go. What to see. Whales & Dolphins of the European Atlantic by Graeme Cresswell & Dylan Walker. 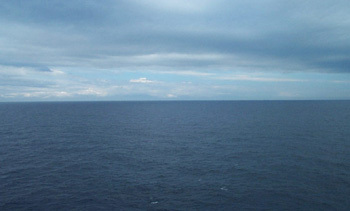 The best locations for large cetaceans are at the southern end of the Bay of Biscay where water is at its deepest. The afternoon and evening on the Southern route and the afternoon and evening of the return leg are most likely to be productive. Day 1 - Tuesday 26th August. Departure at 20.45 hrs. Time to get used to the boat, relax and have an evening meal and good night's sleep. Day 2 - Wednesday 27th August. Recognizing the demand which has arisen in recent years for wildlife watching, P&O Ferries have their own Wildlife Officer on board “The Pride of Bilbao”. Clive Martin is also Director of Biscay Dolphin Research Programme and in addition to two Guided Wildlife Watches (one each way over the most productive waters) he can be found on Deck 11 quite frequently, helping both with spotting and identification of cetaceans in particular. 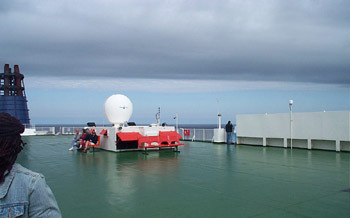 Announcements, relayed to all the outer decks, on the Bridge PA System by the Wildlife Officer draw attention to all Whale and Dolphin encounters. Having rounded the Brittany coast the rest of the day was spent heading south through the Bay of Biscay in calm good weather. During the morning the boat was in relatively unproductive waters until lunchtime when we approached the edge of the continental shelf. At this juncture P&O ferries often vary their cruising pattern to increase chances of encountering cetaceans. Gannets were by far and away the most common birds encountered. We also saw 2 Balearic Shearwaters disturb a Storm-petrel on the water and 5 Sabine's Gulls at distance. Much closer views were had of 3 Bonxies and 2 Arctic Skuas plus a lone Pomarine Skua. A single Turnstone and Golden Plover landed on the boat as did 2 migrating Turtle Doves and 2 Pied Flycatchers. In addition we were treated to close up views of a Convolvulus Hawkmoth and a Hummingbird Hawkmoth which landed on a lifeboat cover almost immediately below where we stood on Deck 11.  Whale and Dolphin species are listed below. Day 3 - Thursday 28th August. After a day at sea, a morning on Spanish soil (for me anyway) provided a welcome change of scenery. 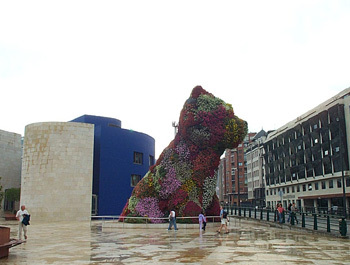 Bilbao 's port is actually the fishing town of Santurtzi, nestling in the Spanish foothills a little over 10 miles/20 minutes from Bilbao. From here it is possible to take a short walk into the surrounding hills in search of the flora and fauna special to the area. The landscape is surprisingly green and fertile with hay meadows and both grazing and wooded pastures. Traditional farming is still practised on the steeper gradients providing a haven for wildlife. The foothills are good for birds and Red-backed Shrike, Fan-tailed Warbler, Sardinian Warbler, Serin, Booted Eagle, Griffon Vulture and Black Kite should all be seen. If you want a break from birding there are several options. 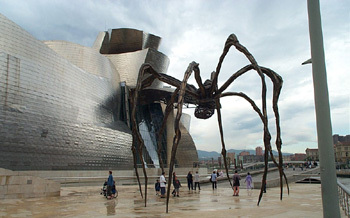 The ship offers coach tours to the Guggenheim Museum, Bilbao old town or along the Cantabrian coast to Castro Urdiales - all at the reasonable price of around £15 per person. Or you can simply enjoy a morning shopping in the centre of Santurtzi just five minutes from the ferry terminal. We decided on culture and visited the Guggenheim. 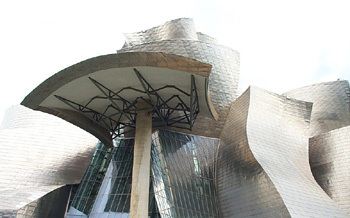 The architecture is spectacular and very modern, as are the exhibits. Not everyone's cup of tea but an experience not to be missed. Return departure is 12.00 hrs and during the afternoon and evening the boat sails over three distinct underwater habitats. First off, resembling the Pyrenees under water, lie huge canyons and trenches over 3000 metres deep. Next, by mid afternoon, comes the abyssal plain - the equivalent of an underwater desert around 4000 metres deep. Finally, by the late afternoon, the continental shelf looms and usually some very productive waters. 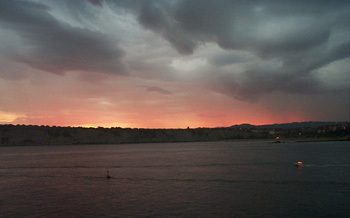 In our case, by mid afternoon, a huge thunderstorm was looming and we were sailing right into it (joy!). As the size of the waves increased and the wind “freshened” the boat began to move, firstly in a gentle rocking motion - back to front - and then much more vigorously. As much as I tried, I couldn't ignore the boat's motion (fully stabilised indeed) and had to retire below decks and, thankfully, to a sickness and aspirin induced sleep which lasted until early the following morning. Nearly six hours birdwatching down the pan, in a manner of speaking. Amanda and Susan, on the other hand, remained on deck to enjoy the full force of the storm, thunder and lightening included. Prior to the weather's intervention we saw 2 Griffon Vultures circling the hills above Bilbao as we departed and a Little Gull and around 20 Common Terns early in the afternoon. Ahead of the storm single Turtle Dove, Yellow Wagtail and Reed Warbler landed on the boat. Day 4 – Friday 29th August. 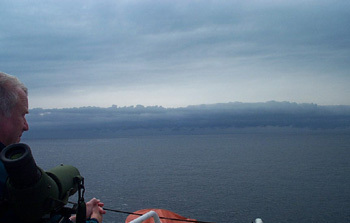 As the final day dawned the storm had passed but the weather was uniformly grey and heavy rain persisted until lunch time as we travelled through the Southwest Approaches in to the English Channel. Seabirds are usually present in good numbers here, but the persistent rain made birding almost impossible and seemed to keep the birds well away from the boat, where they were enveloped in the general miasma. A Manx Shearwater, 3 Cory's Shearwaters plus a few Great Skuas, Arctic Skuas and Gannets (of course) were the best we managed. As we neared shallow and relatively unproductive waters around the south coast of England the rain finally stopped and visibility improved. Approaching Portsmouth we saw several Little Terns and numerous Common Terns and Kittiwakes along with the usual Gull selection. Dependant on the prevailing weather, return to dry land is usually at around 17.15 hrs. I must admit to being a little disappointed with the overall experience, even making allowances for the inclement weather and persistent rain on the last day. Bird numbers were nothing like I expected and measured against the time spent observing sea, waves and more sea; I would assess the overall return as poor with 28 species. Although I did see my two main target species, Sabine's Gull and Storm-petrel, these were definitely long-distance lifers and I have subsequently had much better views of both birds in North Wales (Sabine's) and Workington (Storm-petrel). Then again, perhaps this is typical of sea watching, it tends to be famine or feast. On the same voyage the following week, Europe's third-ever Masked Booby gave absolutely stunning views as it flew ahead of the ship and then surprised all onboard by landing on the bridge wing where it allowed close observation and stayed from 17.15 hrs on Wednesday, only leaving as "The Pride of Bilbao" arrived in Santurtzi at 06.30 hrs on Thursday morning. Obviously, just one of those occasions when you had to be there! As regards The Company of Whales versus our method; it's all down to personal preference and cost – Visit The Company of Whales for August 2003 Trip Records and judge for yourself. Cetacean numbers were higher with the obvious advantage of the forward looking upper platform, but we did see each species. There were a few different birds, but I did go below deck rather early on the return journey and we chose culture over wildlife in Bilbao! If I was to return I would still go independently.